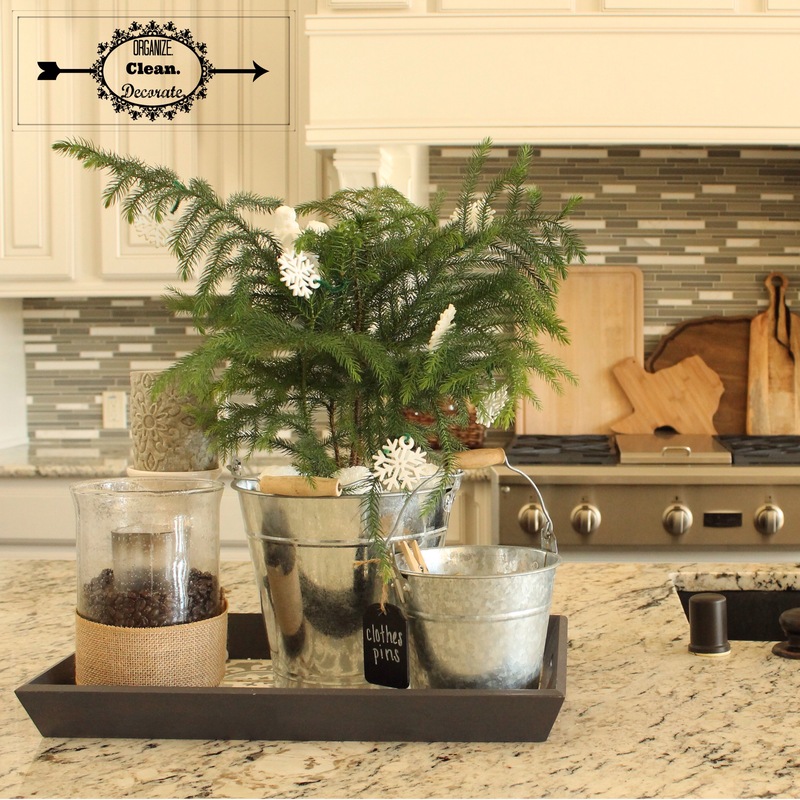 I love using a tray on my kitchen islands to corral things and create fun vignettes with. Using a tray to makes what would be a cluttered-looking counter seem much more neat and tidy. Trays also allow you group together an assortment of objects you might not normally consider clustering together. (Clothes pins, snow balls, candles, and buckets? Why not?!) Utilizing trays also makes cleaning easier, which is always a win in my book. ….. I think y’all get the point- they’re a must have for me in the kitchen. We really love the smell of coffee around here. The taste? Not so much. So I bought some coffee beans and partially filled this seeded glass candle holder with them. After wedging a candle into the coffee beans, I glued a piece of burlap around it and was quite pleased with myself. I absolutely love catching a whif of coffee when I’m standing at the island. It’s been a couple months since I did this and it still smells delightful! Lighting the candle seems to enhance the smell- my guess is because the candle heats up the coffee beans. To add a little more height to balance it all out, I added a white ceramic candle holder from the Dollar General and topped it with a candle from Hobby Lobby. All said and done, this little set up cost me VERY little.